The Cleveland Cavaliers took a big step toward showing their rebuild hand on Friday by working out a three-team trade with the Milwaukee Bucks and Washington Wizards involving George Hill, Matthew Dellavedova, John Henson, Sam Dekker, Jason Smith, and some draft picks. The upshot is that Cleveland took on some guaranteed 2019-20 salary (Dellavedova and Henson) to get some draft picks, most notably Milwaukee’s protected 2021 first-round pick. The Bucks did the trade to add another playoff-ready guard (no offense to Dellavedova, Saint Mary’s College of California, or the proud nation of Australia) and open up additional salary cap space this summer, when Khris Middleton and Eric Bledsoe will be free agents. Hill’s deal has just a $1 million guarantee for next season, while Henson and Dellavedova combine to make $20 million in 2019-20. That’s a cool $19 million of new space for the Bucks to operate under. The Cavaliers have accepted fate and just signaled that there are rebuilding — this is what teams do when they have no intent to be offseason players in free agency, which of course Cleveland does not. The talent trade-off is actually pretty light. The Cavaliers are atrocious; Henson and Dellavedova in place of Hill can’t actually make them worse, because it’s hard to imagine them being worse. But it is interesting to see that this is what the Cavaliers spent the valuable Hill chip on: not a fallen star or high-reward dice roll, but a future first-round pick. This is classic long-term rebuilding. This signals that Cleveland expects to be rebuilding for a while. This won’t be a quick rebound. 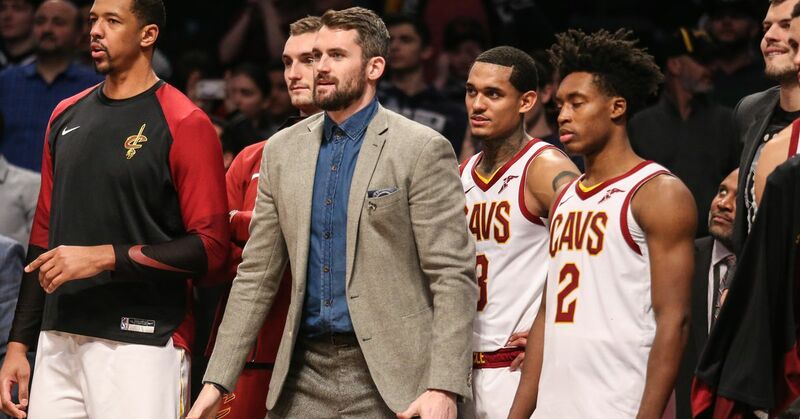 It makes one wonder how Kevin Love fits in. Love is out injured right now (toe), and will supposedly be back in mid-January. This could go one of the three ways. The first is that he suffers a, cough cough, setback, cough and doesn’t play again this season as Cleveland tries to clinch one of the three worst records in the league in anticipation of a nice NBA Draft class. The second is that he comes back roughly on schedule and plays like Kevin Love, but the Cavaliers are still atrocious and no other team makes a nice enough offer to get Cleveland to bite, so he plays into early March before taking a siesta to close the season. The third is that he comes back in January, gets one of these playoff contenders thinking wild, and gets traded for more future assets. No one who would know is saying how they think this will go. It has been noted that Cavaliers pulled off this deal in time to repackage the parts in new trades before the February deadline. That has been noted primarily because J.R. Smith is expected to be traded this season — he has been removed from the day-to-day operations of the club until that happens. But that also matters when it comes to Love. The issue is that the market for Love is pretty uncertain and that the Cavaliers could probably use one really good player to help the young team avoid getting stuck in a half-decade rebuild. Love is on a humongous contract — he signed a four-year, $120 million deal this summer in LeBron’s wake. He’s 30 and while you’d think his elite shooting skill would be a high luxury for this era, his lack of relative mobility and the de-emphasis on offensive rebounding in the current paradigm degrade his value. You could still see him being an All-Star, but given his age he needs to go to the right team — one that expects to compete within 3-4 years, not a rising power. That limits the market somewhat. Do the Cavaliers really want to finish the season with Cedi Osman as their best player? Do they want to enter next season with a core of Osman, Collin Sexton, and a rookie picked in the top seven? Cleveland remembers the post-2010 famine, when the Cavaliers were hideous and depressing every year despite rebuilding the right way and earning immense lottery luck. Does the new front office want to repeat that? Does franchisee Dan Gilbert want to sit through that again? Keeping Love for at least the first part of the rebuild could be an attractive option, even as other veterans jet off. The Cavaliers will still be bad enough to earn high picks, and given lottery reform there’s no huge advantage in being the worst — an incentive exists but it’s been massively reduced from previous years. By keeping Love, the Cavaliers could (in theory) be professional, competitive many nights, and still awful enough to get blue-chip prospects. Trading Love out would (in theory, though see above regarding his market value) add picks to the cupboard and ensure Cleveland was really, really bad for a couple years, which might slightly improve the ability to get the best blue-chip prospects. The lack of a good veteran pro might degrade the development of the young players, though. We’ll find a clue on how the Cavaliers plan to proceed when and if Love comes back in January. If he does, read it as a sign Cleveland is looking to move him. If he doesn’t come back, they are sticking with them for now and should revisit in the summer. Keep an eye on what Love says, too: at age 30, with a championship ring and some All-NBA honors in his past, he might determine how the Cavaliers approach this by telling them he wants to stay or go. Cleveland could and would still move him regardless of his feelings if that’s their plan. But if they plan to keep him and he’d rather leave, the Cavs will be in a pickle. Stay tuned.